Ikke gå glipp av et besøk til to av de gamle romerske byene begravd av Mt Vesuvius i 79 e.Kr. med denne helgedagstur fra Sorrento til Pompeii og Herculaneum. Gå de gamle brosteinene og beundre de godt bevarte bygningene i disse byene frosset i tide. Se ruinene av villaer, templer og offentlige torg. Utforsk det store utgravningen i Pompeii og den mindre på Herculaneum, som er bedre bevart. Kombiner de to for en uforglemmelig dag - ingen ord gjør det rettferdighet. Excellent guide and great day for this tour. We enjoyed visiting both locations so I'd recommend it highly. After seeing Herculaneum our bus had a malfunction on the freeway while driving to Pompeii. Luckily another bus was brought in so there wasn't much down time. The one thing preventing this from being a five star is the wasted time before and after the tour. We were told to meet at a location in Sorrento but after we boarded the bus, it took another 45 minutes to pick up other guests at five different hotels which were a lot closer than we had to travel. Then after the tour it was another waste of time while they dropped off everybody except the 10 of us who started at the location to begin with. They actually could have dropped us closer to our hotel also but didn't. Wasn't happy about that. A good tour, but lunch was not value for money compared to other tours. An enjoyable trip to Pompeii and Herculaneum. First trip of the day was to Herculaneum which is the better preserved of the sites albeit on a smaller scale, after a guided tour of the site we then went for a pre-arranged lunch near to Pompeii which was nice. 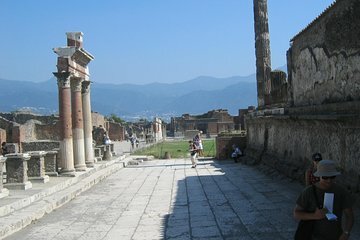 Pompeii itself is a vast site so good walking shoes and plenty of water are definitely worth considering! It was a remarkable trip seeing all the old buildings and also the casts of the bodies. Fantastic trip all in all and the guide was brilliant.